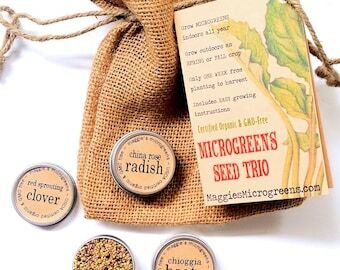 If you have one of my original DIY microgreens seed tin sets, you can refill your reusable seed tins using these seed packets! Those lightproof, airtight tins from your original kit are ideal for seed storage. 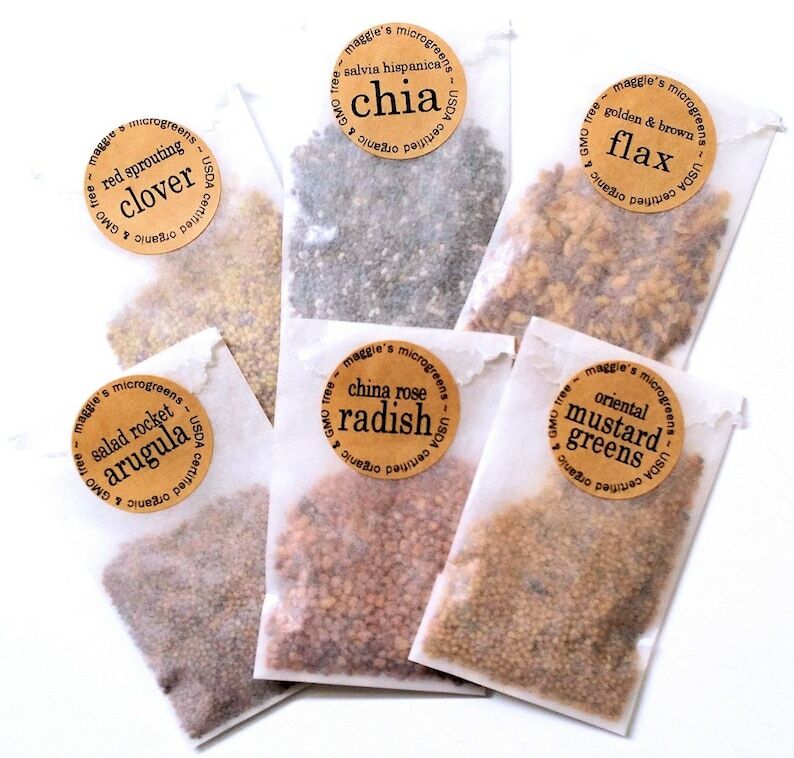 Or, if you happen to prefer "just the seeds" with less packaging and postage - this organic seed set is a great way to jump-start a whole garden of microgreens, indoors year-round, or outdoors in the summertime. Home-grown microgreens are a healthy gourmet treat for beginning or experienced gardeners, or a fun DIY project set for kids. This set contains 6 different varieties of certified organic microgreens seeds, packaged in simple, earth-friendly glassine packets, along with super-easy, detailed growing instructions. I use the same brown kraft paper labels to seal these packets as those on the tins in my original kit. So, if you change out seed varieties, you can peel 'n replace your original tin labels! You'll receive the same half-ounce / 8mL of seeds in each packet as in my Garden in a Box tin set: enough to successfully raise 2 to 3 generous crops of each type in a teacup or pocket garden, or to seed a more widely-spaced outdoor area, approximately 4 feet x 4 feet for each seed. These are USDA-certified organic seeds produced specifically for microgreen growing - meaning, they are not treated with fungicides or fertilizers as conventional garden seeds often are. Just choose "Custom Assortment" from the pull-down list above, then let me know which 6 seed types you'd like in Notes to Seller, and I'll be happy to customize your kit. Amazing seller! The seeds arrived in cute packages with thorough directions. They were a gift for a work secret Santa and I was worried they wouldn't arrive on time -- Maggie shipped them promptly and they came in 3 days! Shipped and arrived quickly! Exactly what I was looking for and the packaging was simple and economical while still being cute. I plan to purchase from this shop again!